Our traditional antidote to Christmas Pudding. We meet at 10.15 on Twickenham Embankment (by Eel Pie Bridge) and cycle through Horton Country Park and Ashsted Common to the cycle track through the Mole Gap. Then we go up Box Hill (not actually that steep) to be rewarded by a spectacular view and lunch at a friendly pub. The way back is mostly downhill so not too late back but do bring lights. Wow – thirty one of us met up so thanks to Jonathan as back-marker for avoiding losses en route. The mild but cloudy weather still made the country park and common attractive and the view from Box Hill is always special. A shock however to find our usual accommodating pub converted into an up-market pub-restaurant. After a drink most of us pressed on to Headley Common where the refreshment van came up with a variety of snacks. 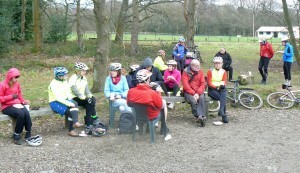 The reunited group then enjoyed the downhill ride with flashes of sunlight getting back to Twickenham by about 4.30. How many helpings of Christmas pudding make 2,076 C ? Not certain how to play this route next year without a suitable sheltered lunch spot on the top. Any suggestions gratefully received.